We have Safety as a priority in Veracel. This value has been shared and reinforced year on year as part of our culture of taking care of ourselves and those around us. The result of this work, which has improved carefully over 26 years, is proved by the numbers. overcoming the record achieved in the previous year – 0.37. See the tables with the occupational health and safety indicators (GRI 403-1, 403-2, 403-4). Getting an accident-free environment with full safety for teams is the challenge of most companies. This has been our goal, our target, and the most important driver for us during 26 years. That’s why we have worked to improve the strategic security management, our main guidelines that have lead our actions over the years. • Safety Committees meetings in the operational areas and Safety Workshop with the participation of partner companies’ managers and Veracel occupational safety area. • Audit program in partner companies by external consultancy, summing four field audits and two documentation audits. • Promotion of safety campaigns. 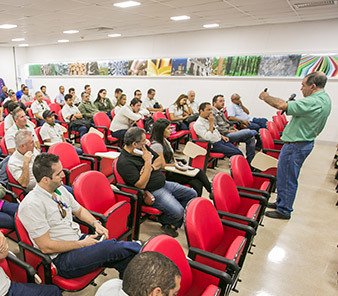 • Intensive use of occupational safety tools by all employees, such as a record of Near-Accident Report (RQA, in Portuguese acronym), Safety Preventive Action (APS, in Portuguese acronym) and Safety Observations. • Accident Prevention Internal Week (Sipat) integrated with several actions. • Management Inspection: a multidisciplinary team goes the field twice a month to observe the employees’ work and identify potential points of improvement in the operational safety. The visits also serve as a reinforcement of awareness-raising messages constantly communicated by them. In 2017, the visits concentrated in the Forestry and Harvesting areas. • Responsibility Matrix of Occupational Safety technicians: at the end of each month, the partner companies’ Safety technicians fill a standard report itemizing the actions developed with their teams. This material is reviewed by Veracel Safety professionals, who scores each report based on a predetermined at the beginning of the year, generating a performances ranking. The results are announced in monthly meetings to recognize and celebrate those that reach the high scores. A multidisciplinary team goes the field twice a month to observe the employees’ work and identify potential points of improvement in the operational safety. The visits also serve as a reinforcement of awareness messages constantly communicated by them. In 2017, the visits concentrated in the Forestry and Harvesting areas. At the end of each month, the partner companies’ Safety technicians fill a standard report itemizing the actions developed with their teams. This material is reviewed by Veracel Safety professionals, who scores each report based on a predetermined at the beginning of the year, generating a performances ranking. The results are announced in monthly meetings to recognize and celebrate those that reach the high scores. In order to keep the Health and Safety subject continuously on the agenda, focusing on the quality evolution of the results, we have to invest in awareness-raising actions, training and recognition. The Viva+ program is one of the tools to do that. 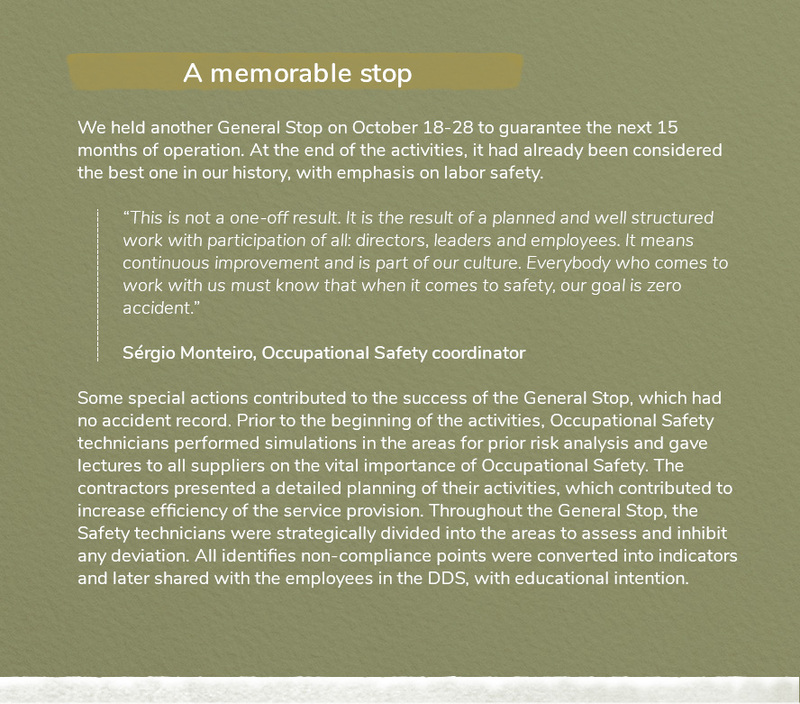 The initiative evaluates the Safety performance of the Veracel and partner companies’ areas and rewards those with the highest score throughout the year, considering predetermined aspects, such as the accident rate, development of activities in SIPAT, participation in DDS and workplace gymnastics. Gym at work? We must have it! Also as part of the continuous search for the employees’ health and well-being, we continued the Ergonomics Program in 2017. The initiative seeks to promote a more comfortable work environment, planned to avoid injuries resulting from the specific activities developed by each employee. In addition, the practice of workplace gymnastics in group contributes to reducing discomforts, relieving stress and improving posture and body awareness.